The Khadamat Cleaning Services Department, in compliance with the UAEU and Khadamat Health and Safety policies is responsible for the day to day management of cleaning, window cleaning and pest control activities at facilities and one meter of building surrounds. The exclusions are Franchise Kitchen, any Catering areas and beyond one meter of the building perimeter. Academics, Sports, Shared Laboratories, Administrative, Dining and Village buildings – Daily cleaning including the collection of waste within the buildings takes place outside of core hours, Saturday through Thursday. Residential buildings – Daily cleaning of communal areas and offices including the collection of waste within the buildings takes place during Core hours, Saturday through Thursday. Students’ bedrooms and en suite washrooms are cleaned every weekend, Thursday through Saturday. Record storage, Archives and Store rooms are cleaned on a two weekly basis. Reactive cleaning and ad hoc pest control service will be provided based on request made through Khadamat Service desk during Core hours, Sunday through Thursday. 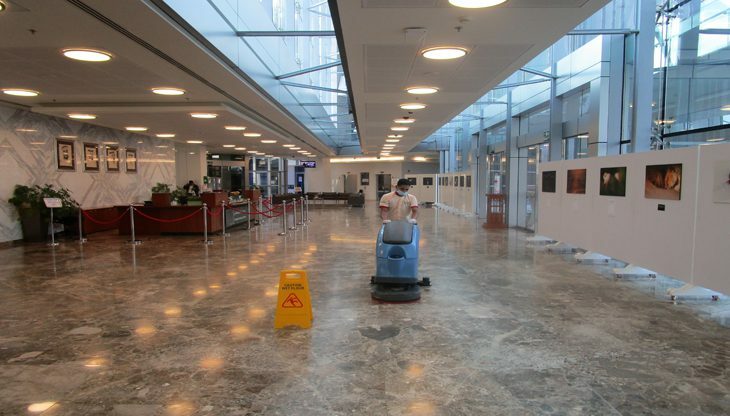 Periodic deep cleaning – hard floor polishing, carpet shampooing, in-depth cleaning of walls, furniture, fixtures, fittings, etc. takes place during University downtime. Window cleaning is carried out on a rolling six monthly basis after the initial cleans. Pest control services are carried out based on scheduled inspections and treatment where required to all internal areas within the buildings and 01m surround. Washroom Consumable items (toilet rolls, hand soap and paper hand towels) are provided and replenished by Khadamat. Post event clean-up of food waste and disposal must be carried out by the catering company appointed for an event. Feminine Hygiene facilities are not provided. The Khadamat Waste Management team manages this upon request. Please contact Khadamat service desk at 03-7138000 or servicedesk@khadamat.ae. The UAEU’s Facilities Management Department (FMD) manages this. You may contact them for the assistance. For more information you may contact Khadamat service desk at 03-7138000 or servicedesk@khadamat.ae.